Beautifully engraved certificate from the First National Bank of Seattle issued no later than 1889. This historic document was printed by A. Gast & Company of St. Louis and has an ornate border around it with a vignette of a woman with an eagle with a train and farming scene in the background. This item has the signature of the Company�s President, George W. Harris. 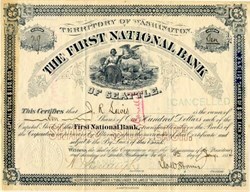 The First National Bank of Seattle was chartered under the National Bank Act in 1882. In 1928, it was controlled by the First National Corporation of Seattle Washington. In 1929, the company merged with the First Seattle Dexter Horton National Bank and in 1931 adopted the original name First National Bank of Seattle. In 1935, the company changed its name to Seattle-First National Bank. In the 1970s, Seattle-First National Bank uses the marketing name Firstbank on signs, advertising and products such as the Firstbank card. 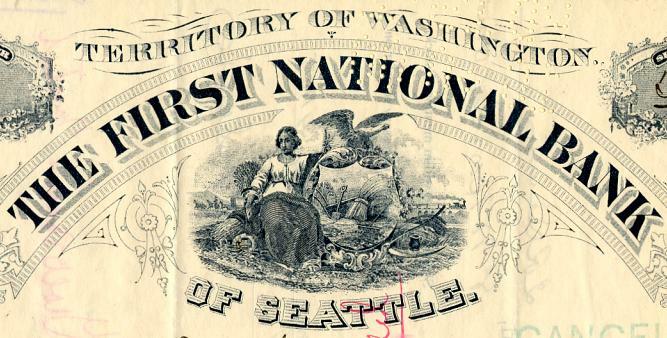 In 1974, Seattle-First National Bank established as a one-bank holding company; Seafirst name was first used. In 1983, Seafirst Corp. was bought by BankAmerica Corp.
George W. Harris was the first president of the bank and was also the founder of the George W. Harris & Company which was a private banking company. George W. Harris was also one of the founders of the Seattle Post-Intelligencer in 1881 along with Thomas Prosch and Samuel L. Crawford and John Leary. George W. Harris was the stepson of Charles Plummer. On March 2, 1853, U.S. President Millard Fillmore signed a bill creating the Territory of Washington out of the Territory of Oregon. The new territory�s boundaries are: north, 49 degree North Latitude; south, approximately due east from the mouth of the Columbia River; east, the Rocky Mountains; west, the Pacific Ocean. The eastern part of the territory would later become part of the states of Idaho and Montana. On November 11, 1889, President Harrison issued a proclamation admitting Washington into the Union. The news reached Olympia by telegram sent from the office of Secretary of State James a. Blaine to Governor Elisha P. Ferry. Since the State Department wired "collect," the governor had to pay 61 cents to read, "The President signed the proclamation declaring Washington to be a state in the union at five o'clock and twenty seven minutes this afternoon."